Therefore, most pressure pulsation systems are designed to provide a single controllable pressure curve (pulsation) which is introduced onto a constant recirculating flow as it passes through a product. This type of test is commonly utilized on varying products types including heat exchangers, condensers, and surge tanks, but can also include valves, pumps, and motors. This methodology can provide both operational and accelerated life expectancy data, but sometimes is unable to provide the actual operational conditions, and their effects, on the product. External reactive pressure fluctuations, within the final circuit’s application, can lead to premature product failure or operational interactions not normally being subjected to a product under test. The most common type of pressure pulsation testing comprises of a fluid flow source and control valving, of varying flows and operational speeds, to briefly restrict the recirculation flow to develop the pressure profile (pulse). These systems can be very cost effective, but the test frequencies are limited to the actuation speed of the valving used to create the pulse. 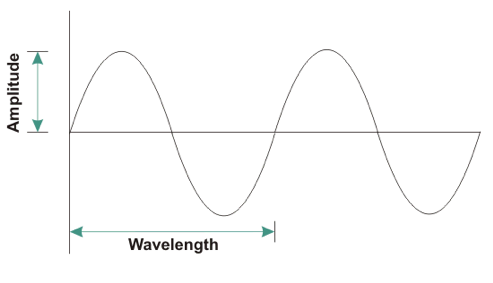 In addition, they are limited to providing coarse sinusoidal based pressure profiles (pressure curves or pulsation waves). 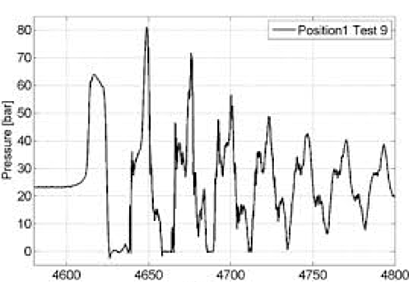 This type of control method generally restricts the test pulse frequency to 1 hertz or slower. Higher-end pulsation systems incorporate a mechanical device, similar to a linear actuator, to compress the fluid volume contained within the test loop. This type of control system closes the loop on pressure and allows for faster compression (pulse) response times. 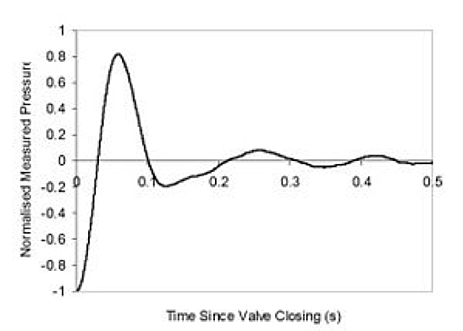 This greater control capability can also support additional pressure profiles such as square waves, triangle waves, and stepped waves; far beyond the standard sinusoidal curve utilized on lower-end systems. Although more expensive, they can provide test frequencies up to 20 hertz; reducing the overall product life cycle test duration(s). An even more advanced test system takes this type of control to the next level. 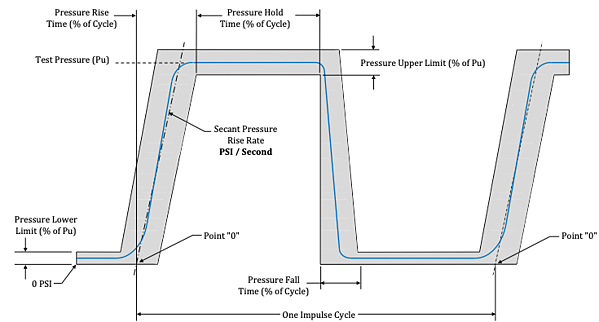 The wave generation is not only controlled by closing the loop on pressure, but an additional control loop is utilized to control the position of the mechanical actuator. This allows for a very high pressure-response, increased test frequencies without degraded profile accuracies, and multiple or custom programmable pressure profiles. They can also provide system response learn-in and adapt on-the-fly compensation for test sample expansion and early failure indication for test components. Most pressure pulsation systems only provide open-ended test fluid to a product’s inlet or outlet port. During this testing, the product’s port is subjected to the controlled pressure profile, but this may not truly represent the actual pressures being imposed upon it during real-world applications. In a closed-loop system, such as a pressurized engine cooling system, components are subject to pressure fluctuations on both upstream and downstream ports. Through the use of these advanced testing processes, the effects of this can now be truly simulated during bench testing. The opening and closing of both up and down-stream valves can cause complex pressure profiles imposed onto the component. These interactions aren’t being compensated for during many of today’s life cycle tests, during the product development or life testing phases, and are only realized during full system operation. Wineman Technology can develop a test system tailored to your testing requirements which provides independently controllable and complex pressure curve(s) on either the inlet port, outlet port, or even simultaneously on both ports. This independent dual-flow method can provide many forms of pressure profiles; even the simulation of water hammer. Product life can benefit from corrective studies to simulate its effects, within accelerated product fatigue testing, and/or its elimination within an operational system. Complete system testing can also be simulated to determine anything from normal water hammer effects on the operation of a single product or the interactive effects from the operation of up or down-stream components. These advanced systems can provide pressure profiles which can be recorded from an actual operational case, fully developed within software, and then tailored to meet your “what-if” system alterations as the product, or complete system, progresses through the development phase. Wineman Technology’s engineering application team can provide a system requirement analysis to help you determine which system level best meets your testing requirements including defining a system to meet both your current and future lab testing life cycles. This may also include a dedicated impulse or pressure pulsation test stand, a combination test stand including burst pressure testing, dual or multiple fluid systems, multiple station test with automatic channel selection / isolation fixtures, or any specialized design to best meet your application solution requirements. As always, we welcome any comments on or suggestions regarding our blog articles to better support our customers’ requirements. For more information on fluid-power based test systems, please contact Wineman Technology for detailed specifications or quotations to meet your testing requirements today.